I spotted a fun art piece by Ian Trask that consists of various sized balls. He made them by wrapping different materials with colored yarn. That got me thinking of decorative spheres. I’m sure many of you may have seen them in stores or you might even have some in your homes. They could be made of rattan, artificial boxwood, jute, seashells, bamboo, artificial moss, teak wood, or even feathers. The variety is endless. All those materials are great, and spheres are fine, but I thought I could take it a bit further by making modular origami. I really love this technique, because origami traditionally doesn’t use glue. There is a rich variety of different shapes you can make, and I encourage you to explore them all. I’m going to teach you how to construct a few shapes that will make great looking decorative accessories for your home. Let’s make it better. Start by cutting out twelve paper squares. If this is your first time, I suggest making your squares 5”x5”. This will make a 4” diameter ball. Fold the square in half by bringing the bottom edge to the top edge. Now you have a rectangle. Fold the rectangle in half by bringing the bottom edge towards the top edge. This makes a skinnier rectangle and divides your square into quarter sections. Following your creases, fold the bottom and top edges inwards to meet in the middle. Fold the left edge up to the top edge to create a point on the left side. Fold the right edge down to the bottom edge to create another point on the right side. Open all your folds again. Following your crease, fold in the bottom right corner, and then fold in the top left corner. Fold the bottom edge inwards to the middle. Following your crease, fold the left edge to the top quarter section. You should have a large triangle and a small triangle forming a point on the left side. Fold the top edge inwards to the center. You should have a pocket on the bottom right side. Fold the top right corner down tucking it into the pocket. Now you have a diamond with a pocket on the bottom right and another pocket on the top left. Fold the diamond in half by bringing the two points to the same side. 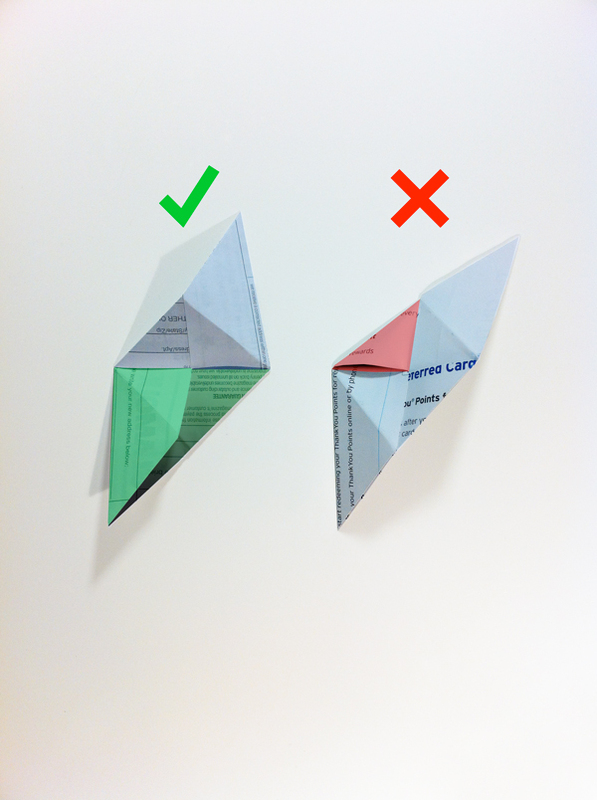 Fold the bottom edge to the right edge to make a triangle. Turn the piece over, and fold the top edge to the left edge to make another triangle. That’s one Sonobe unit. Take a second unit and sparingly apply glue to the under side of one point. Going forward, you will need to apply glue to the underside of each point before inserting. Insert the point of a second unit into the pocket of the first unit. Check out the diagrams to the right for more details on which is the correct pocket and how two join to units together. Take a third unit, and insert its point into the pocket of the second unit. Take the point from the first unit and insert it into the pocket of the third unit. This forms a pyramid with three points sticking out from the base of the pyramid. Take another unit, and insert its point into the pocket of any base point. Take another unit, and insert its point into the pocket of the previous unit. Take the base point, and insert it into the pocket of the last unit. This forms another pyramid. Repeat steps 7-9 to create two more pyramids, one for each remaining base point. This creates a ring of pyramids surrounding the original pyramid. There is a pair of points between each pyramid. Connect each pair together. Flip the piece over. Notice a hollow ball has taken shape, and there are three points. Connect a new Sonobe unit to each of these points to finish up this ring of pyramids. At this point you have seven pyramids all together and three loose points. Connect the three loose points together to form the last and final pyramid. 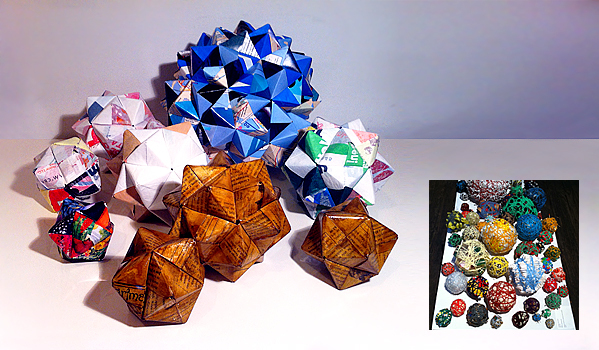 Make a few more balls for your coffee table, and you’ll have a handmade mathematical conversation piece. To make the balls a little more durable and give it some gloss, brush on two coats of shellac. Use amber shellac to impart a warm earthy tone. 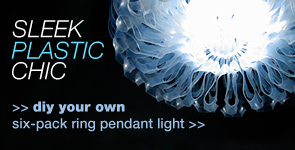 Used fused plastic to make durable, water proof accessories. 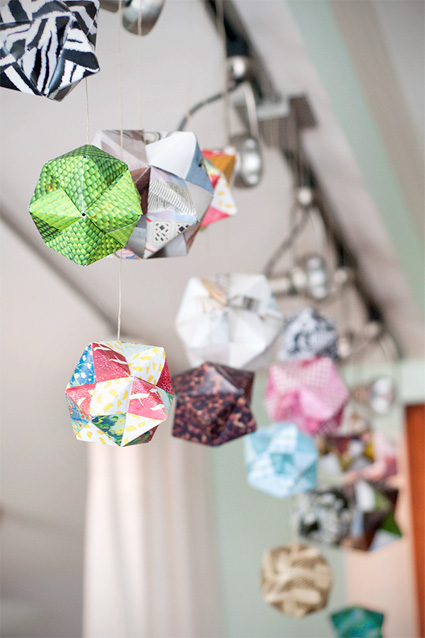 Take a look at the octahedron made by the blogger behind houseofpeters! She constructed it from pages of a food magazine. It's absolutely delicious! 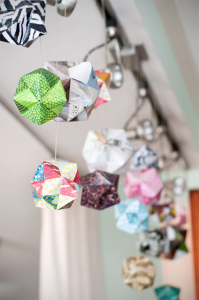 The creative folks over at Yellow Brick Home made octahedrons from scrapbook paper, catalog mailers and Lucky magazines, paying close attention to the use of color and pattern. They hung them up for striking and festive birthday decorations. If you're ready for a bigger origami accessory checkout my tutorial "HOW TO make medium-sized icosahedral origami accessories". I'm making one more tutorial in this series of origami accessories. 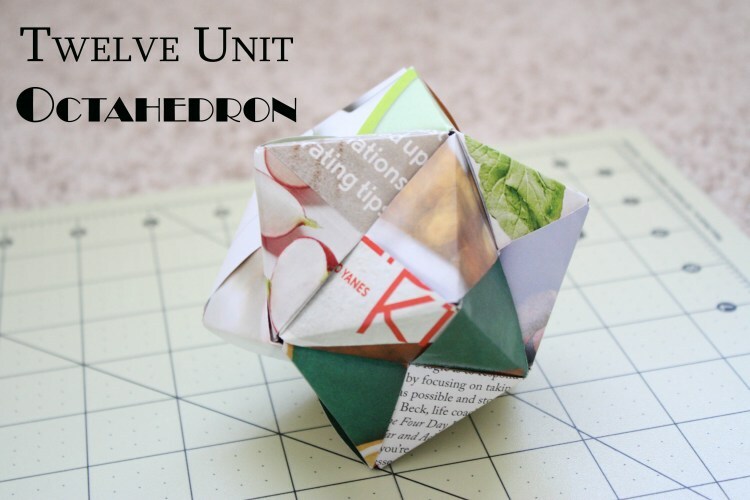 I'll show you how to make the 120 unit hecatonicosahedron that was featured on The Nate Berkus Show. While you are waiting for the GIANT version, go ahead and make your 120 Sonobe units. That way you can hit the ground running, and you'll just have to put the pieces together. Hi, Karen. 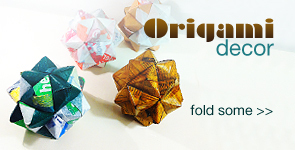 Gosh, I know origami is notoriously confusing! Have a look at the video. I walk and talk you through everything step by step. You’ll see the exact motions of how I maneuver pieces around to fit it all together. AND! You are always welcome to send me a note or post a comment if you have questions. Hey Karen! 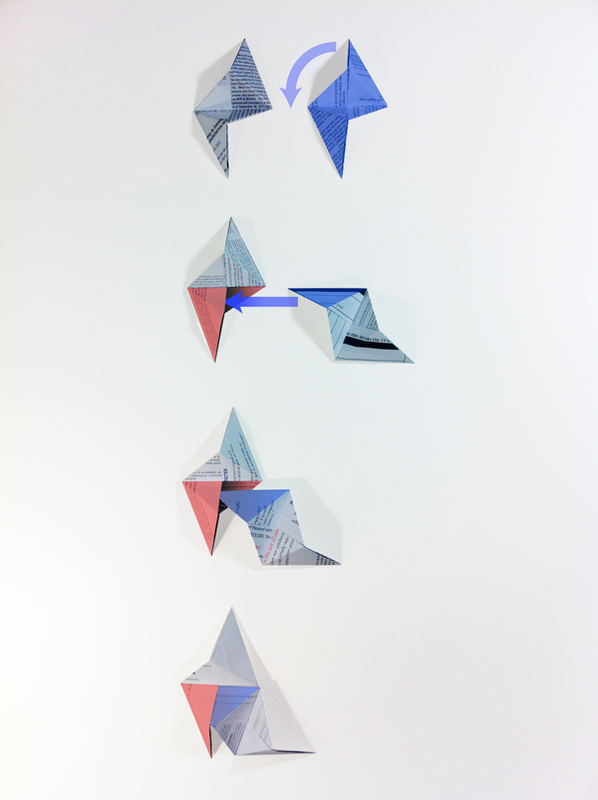 Did you see the new diagrams I put up? Were able to get the project going? The second part of the origami accessories is actually a two parter, cause I’m using fused plastic. It’s going to be super useful! 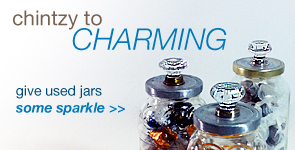 And by the way, you were amazing on the Nate Berkus show! Oh, gosh! Thanks! Really! Thank YOU for watching! I wouldn’t be able to do this if I didn’t have your support, Roslynn. I’m so glad you like my videos and…ROSLYNN!!!! THAT’S SO AWESOME YOU GOT IT ON THE FIRST TRY!!!! Thanks for trying out the tutorial, Roslynn! You gave my photography all new life with the octahedren. Hi – I saw some if these in an artsy store in California but they were quite pricy – like $38 for a medium sized one and I thought – I bet I could make one myself! Checked the Internet and couldn’t find just the right thing because I didn’t know what to call it. Next day I saw you on the Nate show – I think it was a repeat. Anyway now I’ve found you and your videos are great so I’m ready to try. Today a free magazine called Luxe arrived in the mail with nice heavy coated pages of fabrics, gardens, decorating – just perfect for me to start cutting my squares. Im anxious to try it. Thanks for sharing and teaching! Hi Birdy. I’m so glad you caught the show! I do try to make the videos as detailed as possible so anyone can follow the. I’m excited about your fancy luxe origami accessories. You should send me pictures when you’ve made them!.If you at any point you have questions send me a note comment. I hope you have fun making them. Thanks so much watching the show and for writing! Hello again Bao – OK I’ve made the 12 Sonobe units and they look correct but I’m not sure about putting it together. Does it make a difference which flap and which point you use? When I look at the first unit it looks like there are two small triangular flaps and then the two triangular flaps that are part of the points. I’m afraid to glue it all so I may just try it the first time without glue and see if it turns out. Hi Birdy. I put the diagrams up. Have a look in the post! Don’t hesitate to send me a note or post another comment if you have any questions. That’s so cool! Thank you so much for sharing your webpage with me! !